The end to flamboyancy and luxury, long live the regular shapes, simplicity and comfort. These were the key declarations of Classicist architects already in late 18th century. The emotional lace of the Baroque gave way to sculptures reminding of the period of Roman Empire and tall, straight and regular columns. Classicism was brought to Lithuania by famous Lithuanian artist Pranciškus Smuglevičius who completed his studies in Rome and maintained close relationship with the then famous Spampani family of Italian architects. Carlo Spampani came to Vilnius and designed the first Classicist buildings. However, Laurynas Gucevičius who created a masterpiece of Classicism in Vilnius – the Cathedral of Vilnius – is considered to be the most famous representative of Lithuanian Classicism. 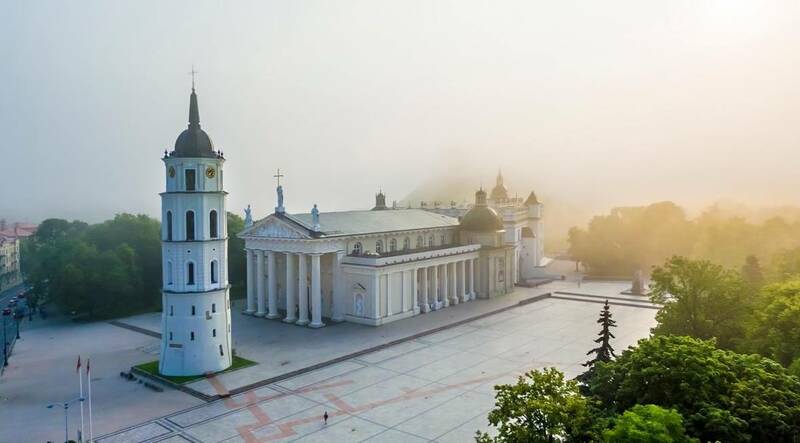 It is the most important sanctuary in Vilnius. It is a unique masterpiece of global architecture. Laurynas Gucevičius who prepared the design of reconstruction of the cathedral wanted to emphasise the values of the Enlightenment Epoch – mind and temperance. Such was Saint Casimir, the patron of Lithuania, to whom the most ornate chapel has been dedicated in the Archcathedral, today considered to be one of the most valuable Baroque monuments in Vilnius. The vault of the cathedral in which meritorious people were laid to rest is a must-see object. As many as 27 crypts of different depth and size have been discovered under the floor of the cathedral. 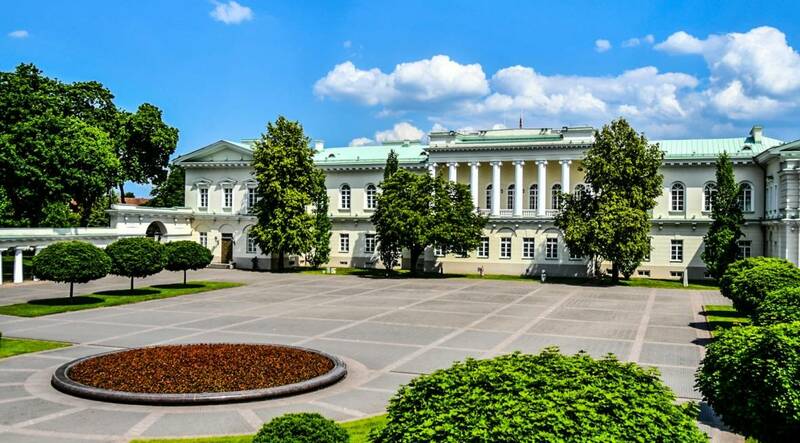 The palace in which Lithuania’s presidents fulfil their duties was built by the first bishop of Vilnius in late 14th century. Passing ages and new owners changed the face of the building – decorated, expanded and rebuilt it. The last owner of the palace, a bishop and renowned patron of artists, Ignotas Jokūbas Masalskis, asked the best architect of that time, Laurynas Gucevičius, to reconstruct it. He turned the building into a perfect artwork of Classicist architecture. It was also recognised by foreign emperors: Russian Tsar Alexander and French Emperor Napoleon lived in the palace during the French-Russian war. It is said that the Town Hall of Vilnius stood in its current location already in the second half of the 16th century. The fires in Vilnius destroyed the building of the Town Hall many times, and the tower failed to withstand all challenges of the passing time. 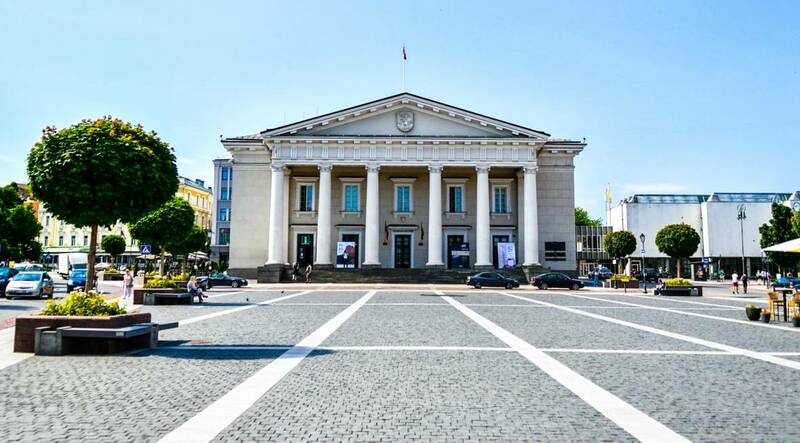 Famous Vilnius architect Laurynas Gucevičius tried to save it, although it was leaning, but the tower fell down and the management of the city decided to rebuild the Town Hall according to the cheapest and simplest architect’s design. The hall of the merchants’ society, the treasury, several shops, the guard and even a prison – everything was contained in this building. Concerts began to be organised in the Town Hall in early 19th century. This tradition has remained to date. It is an unexpected small Paris in Lithuania, the region of Sudovia. It is also an unexpected combination of the architectural styles of Baroque and Classicism. The alley of chestnut trees leading to Paežeriai Manor Palace could tell a story about both glorious and miserable days of the manor homestead. Marcin Knackfus, Professor of Vilnius University and the pioneer of Classicist architecture in Lithuania, designed Paežeriai residence to wealthy landlords Zabiełło. The perfect harmony of proportions, muses dancing on the ceilings, authentic parquet, a dance hall with a balcony for musicians, an old park near the lake. 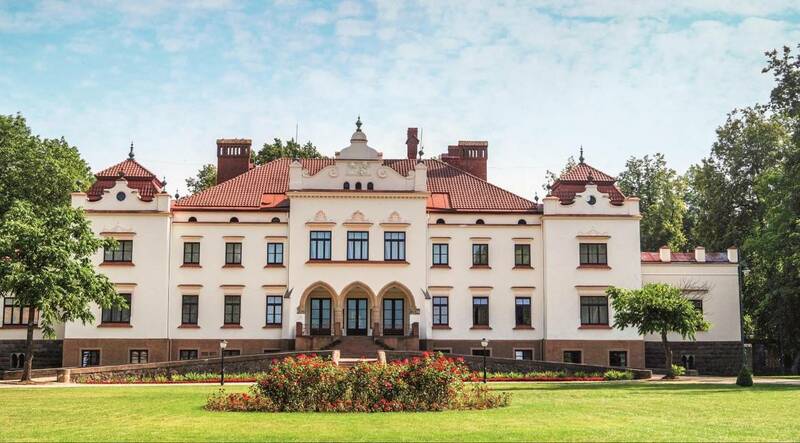 If you would like to grasp the evolution of Lithuania’s architectural styles, visit Rokiškis Manor. You will find everything: from folk construction tradition, Classicism, early Neo-Gothic to Modern style details. 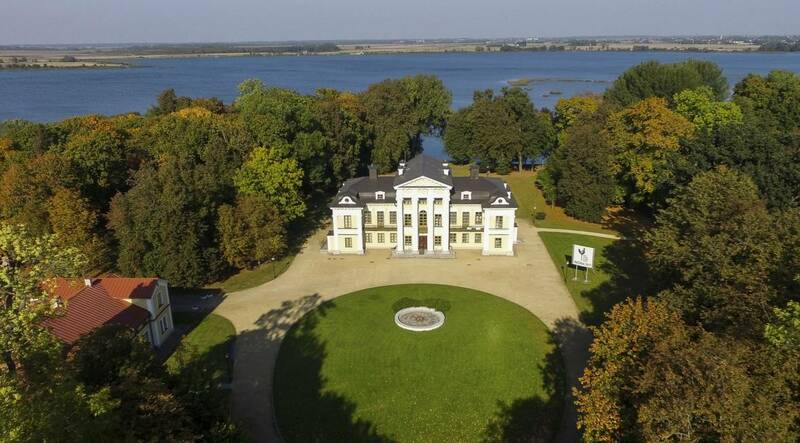 The manor thrived when Ignotas Tyzenhauzas, a descendant of the famous noble family, became its owner in the 18th century. 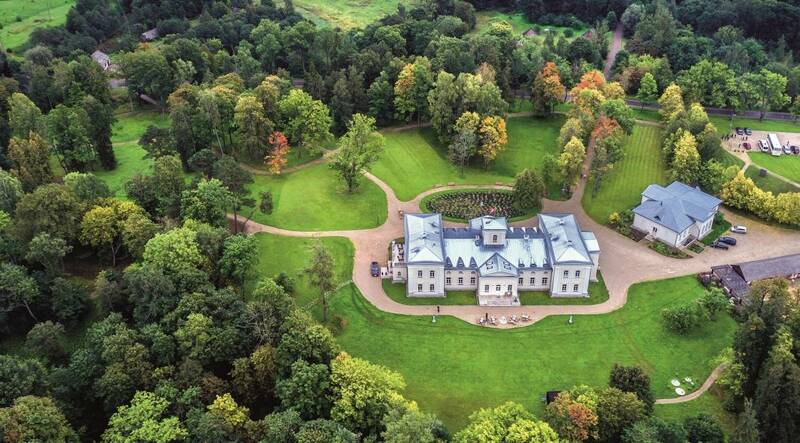 Having established in Rokiškis, he instructed to build a new Classicist manor palace at the road to Riga. According to the order, all houses around the square of the town had to match the manor. The spellbinding beauty of the manor and a splendid park inspired Konstantinas Tyzenhauzas, who inherited the manor, for studies and creation. The owner of the manor, who was interested in ornithology, not only explored and prepared birds in Rokiškis, but also painted magnificent pictures. In early 20th century, the palace of Rokiškis Manor was again restored. The design of Polish architects was successful and Rokiškis Manor became one of the best monuments of Lithuanian historicism. The main accent of the manor ensemble is the palace surrounded by an old park with an area of 30 ha with unique radial alleys. 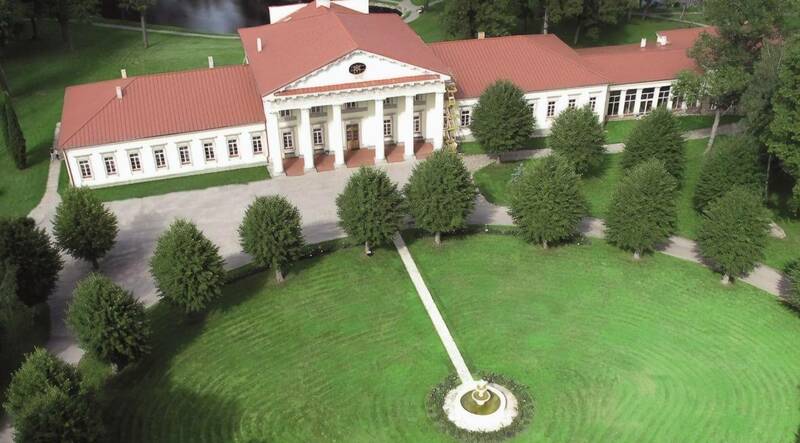 Rokiškis Regional Museum is today housed in the manor, with many halls and rooms dedicated to the manor culture. You can lose your tongue when you see it. A stylish building of the 19th century Neoclassicism, situated on the bank of the River Anykšta, astounds by subtlety and elegance. The manor palace was built in the magnificent shelter of nature by the noble Venclovaitis family of Lithuania and Poland. They established a huge park nearby, in the valley of Anykšta, and everybody is today able to walk along its alleys. Count Benediktas Marikonis was given Taujėnai Manor together with his wife Marija Radvilaitė, a descendant of the famous Radziwiłł (Radvila) family. The manor was her dowry, and the count undertook its reconstruction. It was renovated according to the design of Italian architect Piero de Rosso. The Classicist palace was known for flamboyance and wealth. Roes and fallow-deer were running in the park of the manor, birds were flying over it and swans were swimming in the ponds.